Royal blood flowed through the veins of Colum. Being the son of Fedlimid and Eithne in the county of Donegal in Ireland, he was the great-great-grandson of the once High King of Ireland, Niall Noigiallach. He was given the name Colum (meaning "dove") but over the centuries he has become better known as Columba (the latin derivation of his name) and Colum Cille (meaning "dove of the Church"). Great expectations rested upon Colum's shoulders as he grew up with everybody knowing his royal ancestry. With such a storied history, it's easy to imagine that Colum felt pressure to become a warrior leader in sixth century Ireland. But, his name was Colum and it seemed that God had other plans for him.He received an excellent education at the Clonard Abbey on the river Boyne. He received his education under the guidance of the great teacher Finnian of Clonard. Following in the wake of Patrick and Brigid and being nearly contemporaneous with Brendan paved the way for Colum to become yet another powerful Christian leader in the ruins of a world once controlled by--and now only haunted by--Rome. He was a good student and even now is known as one of the "Twelve Apostles of Ireland." But just because he was a good student doesn't mean he always followed the instruction of his teacher. Finnian had a psalter that he prized not only for its value to the community but, also, for its beautiful poetry. Colum had the opportunity to make a copy of it at Finnian's request. Colum was an appropriate choice because of his intelligence and scribal talent but there was, apparently, a misunderstanding between the two. Finnian understood Colum to be making another copy for the monastery--Colum thought that this copy was for himself. When Colum finished his laborious and skillful copy of the psalter he thanked Finnian for his willingness to make such a wonderful gift but Finnian was surprised that Colum would even suggest such a thing. Over a matter of days, weeks, and months this dispute widened and began to overshadow even itself. Soon, it was about much more than a book and the king of Ireland--Diarmait--was forced to step in to provide resolution. Diarmait sided with Finnian and Colum was stripped of any claim to the psalter. At this time, clan Neill was preparing the wage war on Diarmait and so Colum became their supporter. The two armies went to war at the battle of Cúl Dreimhne with Colum praying for clan Neill and Finnian praying for the armies of the king. The aggressive clan was successful and nearly 3,000 royal soldiers died at their hands. In the aftermath, Colum realized what he had prayed for and began to regret the sin produced by his hasty rage. Colum was outcast from many of the clerical circles of Ireland for daring to pray against the king and Finnian. He didn't try to defend himself against their accusations but, instead, expressed his regret and penitence. 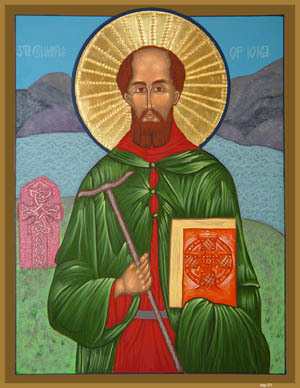 Knowing that exile was likely looming over him, he committed himself to becoming a missionary to Scotland and converting a number of souls equal to those that were lost on the dark day of Cúl Dreimhne. He boarded his ship with twelve of his disciples and sailed to a foreign land for a second chance. He was granted land on the island of Iona where he founded a monastery to serve as the spiritual base of operations for his missionary work. He began circulating not only among the powerful and influential but, also, the poor and outcast. The dark shadow of Cúl Dreimhne followed him as he went among the Picts preaching repentance and forgiveness. Many were converted because of his preaching and the wonders he worked among them. Upon more than one occasion, he healed sick people and escaped plots against his life through miraculous and supernatural means. In the year 597, he died while at the monastery on Iona. He had completed his penitent quest long ago and so he was buried on the grounds of the monastery he founded.